Last week, IBM, in partnership with Apple positioned its Watson analytics platform for the K-12 education market with the launch of the Watson Element for Educators app. The app, designed exclusively for iPad's, collates information covering students likes & dislikes, learning activities, interests and academic achievements to provide a holistic view of a student's school career. Based on this rounded perspective, Watson Element offers guidance for differentiated instruction in the form of content recommendations. Combining potential revenue streams from software licensing and content sales—the platform straddles two hot topics within the EdTech space, the role of analytics and the way content is packaged and delivered in education. Illustration by Bri Hermanson (www.brihermanson.com) The rise of digital education has led to the adoption of multiple disparate software platforms within schools. The increase in digital tools has been accompanied by a growth in data generated by these platforms. 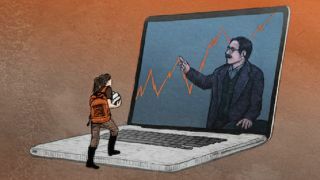 The growing availability of student and institutional data has been met with efforts to aggregate information from multiple platforms to generate insights. IBM, with its Cognos BI platform is just one of the providers of such a solution. In this model a variety of data points are combined to measure institutional wide performance, highlighting the macro impact of individual solutions and initiatives and providing indicators for groups of outliers where intervention may be required. These solutions help administrators analyze trends within the general student population, providing measurement against compliance frameworks and efficacy targets. The introduction of the Watson platform marks a significant move for IBM from the back office into the classroom, with a solution designed to analyze the individual not the institution. The platform is designed for use by teachers, not administrators and aims to support a differentiated learning experience in a similar manner to adaptive learning courseware. Adaptive learning courseware leads students down personalized learning paths where content delivered to the individual is based on their level of ability and knowledge. A student's ability level is defined by usage and with use, platforms build up a picture of knowledge acquisition over time. Watson Element works in a similar way, the big difference here is that Watson is not locked into a predefined proprietary content library as is the case with adaptive learning courseware. This fundamental change in content discovery and course formation has implications for the go to market strategy of content publishers. In today's market, the vast majority of education content is sold direct to schools and districts. In this model, courseware is typically acquired in an aggregated format—an entire textbook or content library or access to a comprehensive online learning platform. The Watson platform, through its content recommendation features has the capacity to recommend content beyond tools already owned by a school. In this model, additional recommended courseware would be acquired via a content portal. Content would be tailored for the individual and as such the purchase of content would be administered by the teacher (in league with the student) and not by the school or district, as is typically the case currently. This has two clear implications for content publishers, firstly, teachers will have a greater influence on content purchases than previously and secondly the content is more likely to be purchased in a disaggregated format (a single lesson or even learning asset) to meet the immediate needs of an individual student. This could have significant long term implications for how content is purchased in K-12 education, with the potential transition from aggregated school and district wide purchasing towards disaggregated purchasing for the individual. In order for this vision to be realized however, the industry movement towards open standards (and by implication the increasing pressure on publishers to allow their content to be disaggregated) needs to continue. Of course Watson Element is not the only platform offering analytics based content recommendations and is just one of a number of platforms and ecosystem developments leading end-users towards disaggregated content but IBM's offering has the potential to be a significant contributor. In the wake of the IBM & Apple announcement, leading educational publisher Pearson announced its intention to utilize the Watson platform as a virtual tutor for higher education. It is currently unclear whether or for how long Apple will remain the exclusive partner for Watson in K-12 education. The benefits for Apple in the partnership are twofold. Firstly, there is the potential for content recommendations to link to materials in its iTunes U platform. Secondly, the tie up offers a clear point of differentiation for the IOS ecosystem. Apple took an early lead in the market appealing to innovative educators by positioning its ecosystem around the transformative power of technology. Its market share in US K-12 mobile device shipments* sat around 50% in 2012 & 2013 when 1:1 roll outs started on mass in the US. More recently, Apple has lost share due to the rapid rise of Chromebooks (which reached 50% share in 2015*). At a time when a large number of Apple's early adopter customers (who purchased 2012 and 2013) are likely looking to replace their devices, this new competitive development will provide a new 'USP' for Apple in the face of stiffer competition from Google and Microsoft. One significant challenge to adoption of this however maybe the move towards a multiple OS scenario (where different OS's are utilized by different age grades and usage models) which has taken place in many US school districts. In this scenario, either the district has to choose to return to a single OS environment or not to utilize the Watson Element platform across all of its students. *Shipments refer to mobile device products only (Notebook, Netbook, Tablet, Chromebook) not including desktop. *K-12 institutional sales only, not including bring your own device.